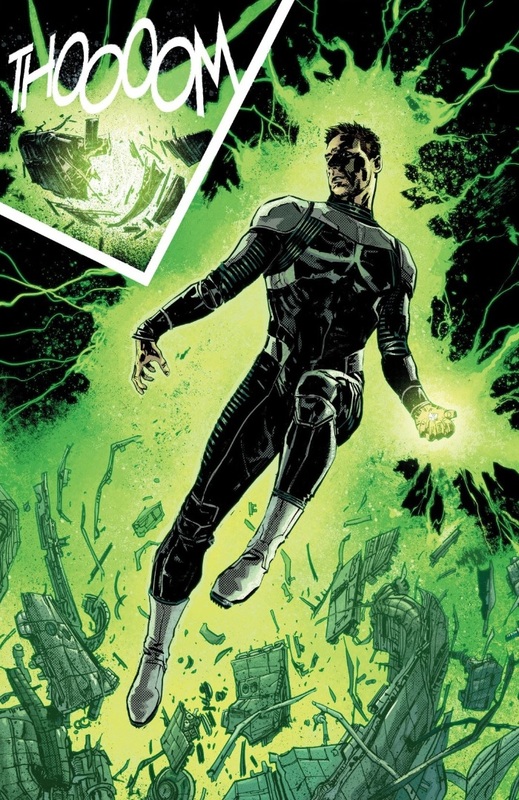 For a large chunk of Green Lantern: Earth One Volume One, Harold Jordan is a passive participant in his own adventures. Hardman and Bechko begin with a Harold Jordan (“Harold” or “Jordan,” never “Hal”) who has already had his chance to be a hero but was used by the system instead. Now he’s running from his problems. Once part of an idealistic NASA, Jordan now spends his days on dead worlds as a scavenger, avoiding the world of life and people for rock and vacuum. There are hints of a greater story here and Hardman and Bechko use those hints sparingly, just enough to keep Jordan’s trials interesting without making Jordan himself an interesting character. While Hardman and Bechko craft an excellently told story, it’s almost in spite of their main character rather than because of him. Instead of focusing on the character of Harold Jordan, exploring any kind of inner turmoil he may face, they concentrate on the universe that’s being opened up to him and his own diminishing numbness to it. Hardman has a movie director’s eye when it comes to laying out a story. With Jordan Boyd on colors, Hardman and Boyd work to establish each panel and scene as the moment it occurs in. Hardman’s instinctive sense of finding these moments weaves them together in a textured way. From the coldness of space to the verdant heat of the power of the Lanterns, Hardman's cinematic eye finds the moments of introspection and spectacle that gives the book its heart. Hardman and Bechko explore the question of what does it mean to have power. The ring is one kind of power but others are influence, subjugation, and deception. Those types of power are what Jordan struggles against and the story is laid out to give each kind its moment of display without ever having to come out and explicitly set up the villains as influential, overpowering, or deceptive. This book is full of all kinds of wonders as mankind, in the form of Jordan, makes multiple first contacts but in a lot of ways, the creators tone down the sense of wonder as they make the story more about survival. The massive Kilowog is introduced in these pages, partly as a sidekick and partly as a guide for Jordan. But Kilowog himself is a Green Lantern who’s merely just tolerated on his planet. 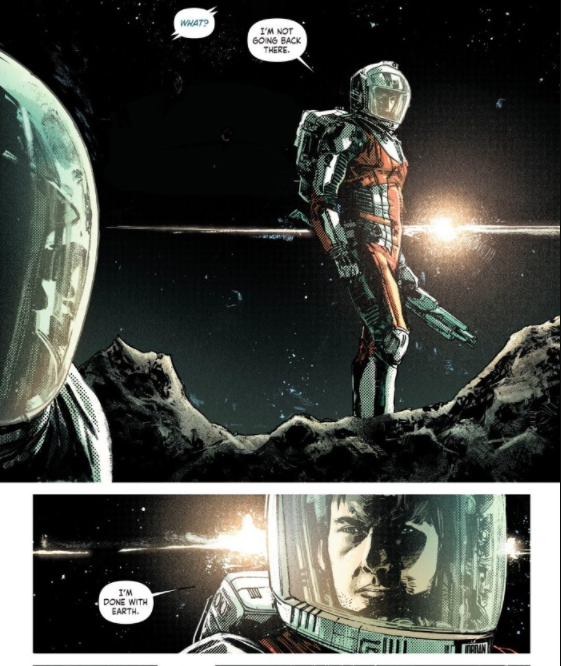 He’s practically humored to imagine himself a hero while his planet’s military does the real work of protecting their world against the robotic Manhunters. These Green Lanterns aren’t the heroes of the galaxy; they’re the crazy men and women of it who think their barely functioning rings are the badges of hope. That’s the story of the Green Lanterns but it’s barely Jordan’s story. As the newbie, he has no idealism about his place in the galaxy. While they establish that Jordan is running from something and slowly reveal what throughout the book, Hardman and Bechko subtly form this portrait of their Harold Jordan, a man who’s been betrayed by one organization so he’s more willing to isolate himself from mankind rather than engage with a system that’s treated him so wrong. Becoming a Green Lantern isn’t an origin story for Jordan but it’s more of an awakening as he discovers something else to believe in. Hardman and Bechko slowly build up Jordan panel after panel, page after page. Jordan’s story works on many levels, some obvious and others less so. Going back to Hardman’s directorial eye, he and Bechko create the kind of science fiction superhero movie that it seems like we’re never going to actually see on the big screen. Their shaping of the story owes as much to Ridley Scott and Christopher Nolan as it does to John Broome and Gil Kane. And they do it in a way that’s faithful to their version of Jordan. This isn’t the cocky flyboy Green Lantern who’s always ready to tell you how great he is. This is a man who has preferred to run from his problems, hiding from himself as much as he is the circumstances of his life. In that way, Hardman and Bechko allow the story to reveal the character rather than letting him tell us who he is. 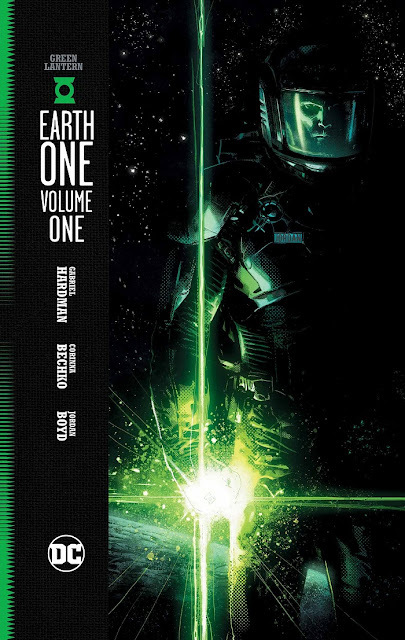 Green Lantern: Earth One Volume One is a tale of hope in believing in something, maybe of believing in anything. Jordan is lost at the start of this book and it takes little green men and magical power rings to snap him out of it. Carrying around the baggage of his past, discovering the universe provides a change of scope and priority for Jordan. Hardman and Bechko give us a story of a man who was used to believing in something once upon a time and now he discovers something else to put his faith into. Unfortunately, he may be substituting one betrayal for another but that seems to be a story for another time.